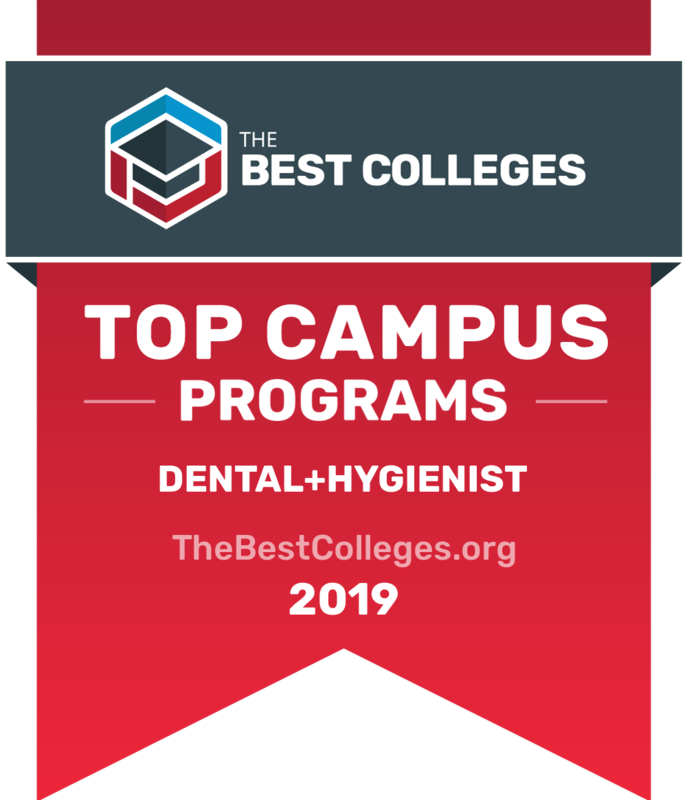 What are the Best Dental Hygienist Programs for 2019? As an increasing number of links are made between oral health and overall health, the need for dental hygienists is also increasing. According to the Bureau of Labor Statistics, the professional outlook for dental hygienists is expected to grow a whopping 19% between 2014 and 2024 -- much faster than the national average for any other profession. The typical entry level education for this field is an associate degree, although some students opt to earn their bachelor's degree. A handful of schools even offer the opportunity to earn a dental hygienist degree online. An associate degree program can be completed anywhere from one to three years and, on average, will earn you an average of $70,000 a year (or $35 an hour). Upon completion of your dental hygienist degree, you will be required to complete a state licensing exam, including a written and practical exam (this exam is required in every state). But first it's important to understand that not all programs are equal -- take a look at our list of the field's top 50 programs below. What Are The Top Dental Hygienist Programs? New York University tops our list for the highest-ranking dental hygienist program in the country. The school offers a fast-track 17-month A.A.S. degree program and a B.S. in dental hygiene. NYU's fast track A.A.S. program's tuition and fees come in at $29,810, its part-time track costs $1,334 per credit, and its B.S. degree carries a price tag of $46,692. The school requires a GPA of least 3.0 or higher for admission, along with high school- or college-level biology and chemistry courses. On and off-campus housing options are available. NYU offers a wide and varied course offering list, including core courses and electives. The Oregon Institute of Technology offers a dental hygienist degree online in the form of a B.S. degree completion program. In order to qualify, learners must have already graduated from an accredited dental hygiene program, or have received departmental approval. In both cases, Oregon Tech students are required to have passed the Dental Hygiene National Board Examination and learners must hold a license (or be eligible for licensure) in the state in which they reside. Oregon Tech's online tuition rate is $227 per credit plus a $60 distance delivery fee. The University of South Dakota offers an online dental hygienist degree in the form of an A.S. to B.S. degree completion program. This program is designed for learners who have either graduated with an A.S. degree in dental hygiene or are currently enrolled in a US-based program accredited by the ADA Commission on Dental Accreditation (CODA). In order to qualify for consideration, students must pass a criminal background check. USD's degree completion plan requires the completion of 120 credits at $335 per online credit. For a detailed breakdown of the program's requirements and coursework, see the school's website. Located in Tulsa, Oklahoma, Community Care College administers a dental assisting program that includes an on-campus dental lab. At CCC, students practice sterilization procedures, take dental impressions, learn radiography, and study patient care. The program is offered as a degree or diploma and both opportunities prepare students to pursue a Certificate in dental assisting (CDA). CCC's program can be completed in as little as eight months, following a weekday/evening schedule. Course offerings include training in oral hygiene instruction, patient care, insurance billing and coding, and dental software. Tuition and fees total $14,459 and, according to the school, job placement rates for students who complete the program stand at a high 88%. North Dakota State College of Science offers enrolled learners a 10-month dental assistantship program and a two-year dental hygiene program. Most students in the school's dental assisting program have completed at least one year of college. Within the dental assisting program, students have the option of earning a certificate or an A.A.S. Students must complete 41 credits to receive NDSCS's dental assisting certificate. Admission requirements include a high school diploma, a minimum GPA of 2.0, and eight hours of observation in a dental office. NDSCS's dental assisting A.A.S. consists of 66 credits. The school's dental hygiene program also offers an A.A.S., which requires learners to complete at least one year of prerequisite courses (71 credits). NDSCS's admission requirements include the completion of an entrance exam along with a variety of biology and chemistry courses. Located in Taft, California, Taft College's dental hygiene program offers a certificate as well as an A.S. Degree in dental hygiene. Both can be achieved at the end of a two-year program. Taft's programs are designed in a manner where each semester builds upon the last, in both didactic and clinical curriculum. The school admits 20 students each fall semester. Program admittance requires a GPA of at least 2.5 and several other prerequisites, such as human anatomy, basic nutrition, microbiology, and more. For a complete listing, visit Taft's website. The school estimates that the program's cost totals to $14,253. A component of the State University of New York System, Farmingdale State College offers an A.A.S. in dental hygiene. The school requires that learners who intend to apply directly from high school must first complete two units of laboratory biology, chemistry, and algebra, along with a course in either geometry or trigonometry. Applicants not applying directly from high school must complete the same prerequisites and additional courses in English composition, anatomy, physiology, and medical microbiology. Applicants must also be certified in basic life support procedures. The school requires students to maintain a minimum of "C" in all Dental Hygiene courses at all times throughout the program. In addition to the A.A.S. degree program, the school offers an entry level bachelor's program and a bachelor's degree completion program. Located in Big Rapids, Michigan, Ferris State University offers a dental hygienist degree online for learners who already hold an A.S. in dental hygiene and seek to further pursue their education in a fully online environment. This degree completion program leads to a B.S. in dental hygiene. Admission requirements include the completion of an A.S. from an accredited dental hygiene program and a minimum cumulative GPA of 2.5. In this degree program, students must continuously enroll every fall and spring semester to be considered an active student. During a student's freshman and sophomore years, tuition rates total $402 per credit, while during the junior and senior years, tuition rates are slightly more at $413 per credit. Located in Collegedale, Tennessee, Southern Adventist University offers an allied health dental hygienist degree program administered and taught by a network of clinical health care professionals. SAU's A.S. in pre-dental hygiene requires the completion of 64 credits and enrolled learners must maintain a C average or better. Tuition rates are influenced by credit completion: at 12 credits, credits cost $870 each, whereas once you've reached 16 credits, tuition drops down to $660 per credit. Located in Watertown, South Dakota, Lake Area Technical Institute stands out among dental assistant online schools in part due to its hybrid e-degree program, which blends distance and on-campus learning. The school's on-campus lab requirements comprise approximately 12 days per semester along with the completion of 300 hours of clinical experience in a dental office approved by the school's administration. Lake Area Tech's e-degree is designed for part-time students -- the school's program allows busy learners to earn a diploma in five semesters, and an A.A.S. in as little as seven semesters. Lake Area Tech's dental assisting program prepares students to perform a wide variety of tasks in dental environments. For example, upon completion, students are prepared to assist dentists during procedures, take X-rays, administer nitrous oxide/oxygen to patients, polish teeth, fabricate casts for dental procedures, and sterilize equipment. The University of New Haven’s three-year A.S. Degree and four-year B.S. Degree is offered as an on-campus only. If, however, you are looking to enter into a Degree Completion Program, this can be achieved online. Here, you can set your own pace, taking as many or as few courses as you want. Graduates of the Dental Hygiene Program have gone on to work in private practice, community health centers, higher education teaching posts, and even pharmaceutical sales. Manhattan Area Technical College offers an A.A.S. degree program in dental hygiene. This program includes general education and technical education coursework, and provides students with training in both classroom and clinical environments. MATC's 72-credit program takes two years to complete and requires the completion of three science-based courses as prerequisites: anatomy and physiology, microbiology, and chemistry. These prerequisites are in addition to general education course prerequisites in English composition and algebra. A minimum GPA of 2.8 is required for entrance into the program. MATC's total estimated cost -- including tuition, fees, books, and supplies -- is $37,155. In turn, the school projects the average annual wage earned by graduates to be between $54,830 and $69,640. Indiana University-Purdue University Indianapolis offers a certificate in dental assisting, an A.S. in dental hygiene, and a B.S. in dental hygiene. IUPUI's certificate can be completed in one academic year (or two semesters) and consists of a total of 15 courses. The school's online dental assistant program allows students to complete most of their nonclinical courses online, while receiving clinical experience in dental offices in their community. IUPUI's A.S. in dental hygiene is a 40-credit degree program with eligibility requirements including an overall GPA of 2.7 or higher and a science GPA of 3.0 or higher. The program requires the completion of specific prerequisite courses, a personal statement, and eight hours of observation at two separate dental offices. IUPUI's B.S. in dental hygiene program is designed to meet the needs of busy part-time students who intend to work while pursuing their degree. Admission requirements include the completion of 90 credits, graduation from an accredited dental hygiene program, completion of the National Board Dental Hygiene Exam, and current licensure as a dental hygienist. Located in Los Altos Hills, California, Foothill College offers learners both a dental assisting and a dental hygienist degree program. Each program consists of 55 credits and takes 10 months to complete. Foothill's dental assisting program consists of both a certificate and an A.S. degree. To enter the program, applicants must first hold a high school diploma or a GED. The school's dental hygienist program is a four-year B.S. degree consisting of 192 credits. The program requires the completion of two years of prerequisite courses and two years of dental hygiene core courses.Prerequisites include a high school diploma or GED and a college GPA of 2.5 or higher. The University of Alaska Fairbanks offers students a dental assistant certificate and A.A.S. degree in dental hygiene. The certificate requires students to complete 30 to 42 credits and the school's A.A.S. degree requires 60 to 61 credits. This is a three-year program containing one year of prerequisite science and general education courses, and two years of coursework in dental hygiene. The program follows an intensive 40-hour-per-week curriculum, including some evening classes and clinicals. Admission requirements include proof of immunity to several diseases such as rubella and hepatitis, and evidence of freedom from tuberculosis or PPD. CPR certificates are required. USI offers a B.S. in dental hygiene for which it administers three tracks: a traditional four-year program, a degree completion program for those who hold an A.S., and an accelerated three-year program. Each track requires the completion of 120 credits and only 24 students are accepted into the program each year. Students must maintain a GPA of at least 2.8 throughout the program. Admission requirements include the completion of certain prerequisite courses and a minimum GPA of 2.8. Located in Oxnard, California, Oxnard College offers students a two-year A.S. degree dental hygiene program. The school provides students with the opportunity to work with patients at the Oxnard College Dental Clinic and Oxnard recommends a completion program covering high school algebra, biology, and chemistry. Admission into the program requires a minimum GPA of 3.0 and a valid CPR card. The school estimates resident student expenses to total to about $11,000 over the first semester and $3,000 in the second. Non-resident students can expect expenses of about $17,000 over the first semester and $8,000 over the second. Costs and fees include instruments, equipment, and uniforms. Central Carolina Community College offers a diploma in dental assisting that can be completed it less than a year. Additionally, the school administers a two-yearA.S. in dental hygiene program. Total cost for the dental assisting diploma is $5,586.45. Upon completion, students are able to perform chairside procedures, sterilize instruments, instruct patients on postoperative care, and place dental sealants. Total costs for CCCC's A.S. in dental hygiene add up to be $12,829 and, upon completion, students are able to perform tasks such as removing plaque and stains from teeth, applying fluorides and sealants, providing dietary counseling, and conducting oral cancer screenings. Western Kentucky University offers a dental hygienist degree online in the form of a B.S. degree completion program. This school is tailored to needs of students holding an A.S. degree from an accredited dental hygiene program. WKU makes financial aid available to its students and offers military tuition assistance. The school uses Blackboard as its online learning platform. Located in Utqiagvik, Alaska, Ilisagvik College offers a dental assistant trainee program through allied health. Before acceptance, applicants must meet general admission requirements and must pass a criminal background check. Allied Health may require the completion of additional admission prerequisites for program acceptance. Upon completion of the school's dental assistant trainee program, students are able to collect diagnostic data, manage hazard control, perform clinical supportive treatments, take diagnostic radiographs, and more. Minnesota West Community and Technical College offers a dental assistant diploma and an A.A.S. in dental assisting. This diploma is a 48-credit program in which students will spend 10 weeks in clinicals. MWCTC's A.A.S. degree is a 60-credit program in which students will spend 10 weeks in extramural clinical experiences in area dental offices. Prerequisites for both programs include CPR certification, a hepatitis B vaccination, and a GPA with a C average or better. While in each program, students must maintain a GPA of at least 2.0. Coursework includes general studies, bio-medical and dental sciences, and clinical experiences. The school estimates that tuition and fees total $188 per credit. Located in Oakwood, Georgia near the shores of Lake Lanier, Lanier Technical College offers a dental assisting diploma and an A.A.S. in dental hygiene. Lanier Tech admits 21 students into its dental assisting diploma program each summer and all new students must meet with the school's program director prior to registration. Prospective students must also attend a 45-minute lab observation on campus before beginning the program's occupational courses. Lanier Tech admits only 15 people into its A.A.S. in dental hygiene program at the beginning of each fall semester. The program can be completed in five semesters (or 21 months), including a summer session. Prospective students must first enter the Lanier Tech's healthcare science certificate program to meet minimum core requirements. Tuition for both programs is a very low $89 a credit. Located in Emporia, Kansas, Flint Hills Technical College offers both a one-year dental assisting certificate and a two-year A.A.S. degree in dental hygiene. Applicants to the dental assisting program must complete a pre-enrollment interview with faculty to determine program acceptance. Flint Hills estimates a total cost of $9,350 for this certificate. Applicants in the dental hygiene program must pass the TEAS or ACT entrance exam. Prerequisites include courses in anatomy, physiology, microbiology, chemistry, and English composition. Additionally, program acceptance requires a minimum GPA of 2.8. According to Flint Hills, the total estimated cost for an A.A.S. degree is $14,733. Flint Hills' student pass rate for the national board, jurisprudence and clinical exams since the inception of the program has been between 98-100%. The assisting and hygeine dental programs have both passed CODA accreditation site visits with no recommendations. The state's largest university, the University of Alaska Anchorage offers a dental assisting program with two options: a 34-credit undergraduate certificate program and a 60-credit A.A.S. degree. Both programs select students each May and coursework begins each August. A.A.S. degree students can start taking support courses at the beginning of any semester. In the 34-credit certificate program, students complete 17 credits in the fall semester, 14 credits in the spring semester, and three credits over the summer. Most classes are offered Monday through Friday, 8:00 AM to 5:00 PM, but some courses require evening and weekend hours. UAA's 60-credit A.A.S. degree program requires the completion of six credits of math, humanities, social sciences, or natural sciences. The school estimates that tuition costs $192 per credit and non-residents can expect tuition to cost $681 a credit. Located in East Hartford, Connecticut, Goodwin College offers an 80-credit A.S. degree in dental hygiene. This program offers a state-of-the-art dental lab, where students can perfect their skills in a professionally supervised setting, and a functional dental office with, for example, waiting areas for patients. This is a two-year, six-semester program and classes are available in a hybrid format with certain clinical requirements. Full-time students taking 12 to 18 credits a semester can expect estimated tuition costs of $9,750 per semester and learners taking nine to 11 credits per semester can expect tuition costs of $6,900 per semester. Students taking six to eight credits per semester can expect tuition to cost $4,915 per semester while students who are only able to take six credits or less per semester pay $690 per credit. Located in Renton, Washington, Renton Technical College offers a dental assistant certificate of completion that consists of 71 credits. Renton Tech also offers an A.A.S. in dental assisting with a program length of 91 credits. All applicants must be at least 18 years of age, must hold a high school diploma, must pass a nationwide criminal background check, have proof of health insurance, and must be able to present a current evaluation from a physician. Students may begin coursework in either the fall or winter semester. According to the school, tuition costs are $109 per credit for Washington residents, $123 per credit for non-Washington residents, and $286 per credit for international students. Classes are scheduled from Monday to Friday, 8:00 AM to 2:30 PM. With campuses in Pleasant Hill, California and San Ramon, California, Diablo Valley College offers both an A.S. in dental assisting and an A.S. in dental hygiene. DBC's dental assisting program is a nine-month, 43-credit program and students are required to complete all coursework in two semesters, beginning in the fall of each academic year. Only 24 students are admitted each academic year and applicants are chosen by a lottery system. The dental hygiene program is a two-year, 74-credit program. Students are required to complete all coursework in two years, including summer sessions. Like the first of the two programs, DBC uses a lottery system to accept 20 students a year into the program. Located in the pleasantly-named city of Appleton, Wisconsin, Fox Valley Technical College offers a dental assistant diploma. This 33-credit program costs approximately $5,758.05 in tuition and fees. Admission requirements include a skills assessment test and a high school transcript and diploma. Students will enroll in courses covering topics such as dental radiology, dental chairside, dental office management, and dental radiography. Graduates of this program have gone on to become dental office managers, dental insurance claim representatives, dental sales representatives, and lab assistants. Affiliated with Pennsylvania State University, the Pennsylvania College of Technology offers its students an A.A.S. in dental hygiene. The program consists of 78 credits and the school recommends SAT or ACT scores for applicants applying within two years of high school graduation. Students will be best-equipped if they've completed at least one year of high school biology, two years of high school algebra, and courses in chemistry with a lab component. Applicants must have a minimum GPA of 2.0. Once accepted into the program, students must maintain an average grade of C or higher. Located in Wytheville, Virginia, Wytheville Community College offers students a five-semester, two-year A.A.S in dental hygiene. Admission requirements include a placement exam, the completion of a high school biology course with at least a C average, the completion of a high school chemistry course with at least a C average, an overall GPA of 2.0, and 16 hours of observation in a dental office. Upon admission into the program, students must complete a medical examination and pass a criminal background check. At minimum, a C average must be maintained at all times. Virginia residents pay $137 per credit while non-residents pay $314.35 per credit. Nebraska's Central Community Colleges offers a dental assisting program and a dental hygiene program. CCC's dental assisting program offers students both a diploma and an A.A.S. degree. Students can expect to complete the school's 43-credit diploma in one year and the 61-credit A.A.S. in two years. The 61-credit dental assisting degree costs $6,100 for Nebraska residents and $8,784 for non-residents. Students enrolled in the two-year dental hygiene A.A.S. degree program attend regular group lectures and lab classes where they gain practical, hands-on experience through the school's dental hygiene clinic. The clinic is open to the public. Program costs for Nebraska residents total $8,100, whereas non-residents can expect to pay $11,664. Students taking 12 to 14 credits per semester over the course of six semesters -- including one summer session -- can complete the program within three years. Located in Columbus, Georgia, Columbus Technical College offers a 55-credit dental assisting diploma and an 83-credit A.A.S. in dental hygiene. The school estimates that tuition and fees for its dental assisting diploma total to $7,995 (books and supplies add an additional $1,590). The diploma takes 70 weeks to complete. Columbus Tech requires that students maintain a C average at all times for both programs. Coastal Carolina Community College offers a one-year dental assisting diploma, beginning every fall semester, and a two-year A.A.S. in dental hygiene, also beginning every fall semester. CCCC estimates that its dental assisting diploma costs a total of $3,683. Once instruments, supplies, books, exam fees, and other costs are calculated, total program completion comes in at about $8,109. CCCC's A.A.S. in dental hygiene encompasses two 16-week semesters and one five-week summer session. This program is only available to full-time students and the school accepts a maximum of 18 students each fall. Basic admission requirements include a high school diploma, official transcripts, completion of a placement exam, and completed algebra and chemistry courses. Tuition costs for all five semesters totals to $5,613. Once instruments, supplies, books, exam fees, and other costs are calculated, total program completion costs add up to $14,095. Located in Wausau, Wisconsin, Northcentral Technical College offers both a 16-credit dental assistant diploma and a 70-credit A.A.S. in dental hygiene. Both programs are only offered on-campus. This diploma costs approximately $3,268 and the program requires a criminal background check. Current CPR certification is required prior to clinical placement. Northcentral Tech's A.A.S in dental hygiene offers a hybrid learning option and, while some courses can be completed online, clinicals must be completed in-person. The approximate cost for this program is $14,816. A criminal background check and CPR requirement are also required for Northcentral Tech's A.A.S. Located in rural Vidalia, Georgia, Southeastern Technical College offers an A.A.S. in dental hygiene. Tuition and fees add up to $10,117, and the program follows a semester-based system. Prospective students who need to take any of the program's nine prerequisites may do so any semester. Once program prerequisites have been completed and students have been accepted into the program, the 86-credit program lasts for six semesters. Entrance requirements include the submission of high school transcripts and college transcripts, the completion of a placement test (if applicable), and the attendance of a mandatory dental hygiene information session. Atlanta Technical College offers an A.A.S. in dental hygiene. Entrance requirements are extensive and include a high school diploma, TEAS test scores, a placement exam, a letter of intent, and CPR certification. Students must maintain a 3.0 GPA throughout the program. The program lasts five semesters, during which students must complete 84 credits to graduate. Courses are offered solely during the day, requiring a full-time student commitment. Georgia residents pay a low $89 per credit, whereas that rate is doubled for out-of-state students ($178 per credit). Located in hilly Hickory, North Carolina, Catawba Valley Community College offers an A.A.S. in dental hygiene. All core courses are offered during daylight hours, requiring a full-time commitment from students. The program consists of seven semesters -- beginning with a fall semester -- and takes two years to complete. Costs associated with this degree program are estimated at $9,500, including tuition, testing, licensure fees, and equipment costs. Admission requirements include the submission of high school transcripts and college transcripts, if applicable. The school requires applicants to complete a placement examination with a minimum grade of C. SAT or ACT scores must also be submitted, as well as proof of applicant completion of 12 observation hours in a dental office. Located in Winston-Salem, North Carolina, Forsyth Technical Community College offers an A.A.S. in dental hygiene. For the past 11 years in a row, Forsyth Tech has had a 100% pass rate on their DH National Board Examination. The school admits a maximum of 14 students every fall semester. This is a 74-credit curriculum, with classes offered during daylight hours. Admission requirements include the completion of a high school diploma with an average of C or better, completion of a Forsyth Tech Medical Form, the passing of a criminal background test and drug screening, and completion of eight hours of observation at a dental office. The school estimates that total program costs come to $11,560. Central Georgia Technical College offers enrolled learners an A.A.S. in dental hygiene. Depending on which of the school's campuses a student attends, Central Georgia Tech's 83-credit program offers entrance dates at the beginning of the summer and fall semesters. In-state residents pay a low $89 per credit, out of state residents pay double that at $178 per credit, and international students pay $356 per credit. Admission requirements include the completion of six required core courses: English composition, algebra, chemistry, anatomy and physiology, and microbiology. The school also requires applicants to have first completed the Psychological Services Bureau Allied Health Aptitude Examination. The University of Bridgeport, Connecticut offers an A.S. in dental hygiene, as well as a B.S in dental hygiene. The school's A.S. degree program includes a two-year, 73-credit curriculum. High school applicants must possess a 3.0 GPA or higher, and transfer applicants must have maintained an overall GPA of at least 2.5 during their course of study. All students must complete five prerequisite courses, including classes on English composition, chemistry, algebra, anatomy, and physiology. Bridgeport's B.S. degree program consists of a 122-credit curriculum. Admission requirements include the completion of a high school diploma (which, in turn, must include four years of English, two years of math, one year of chemistry, and one year of biology). The school requires applicants to hold an overall GPA of 3.0 or higher, and to have completed the SAT or ACT exam. The school estimates that traditional full-time tuition costs $15,074. Located in its celebrated namesake Georgia city, Savannah Technical College offers learners a dental assisting diploma and an A.S. in dental hygiene. The school's diploma is a four-term program consisting of 55 credits. Entrance requirements include the submission of a high school diploma and completion of a college entrance exam. Savannah Tech's A.S. in dental hygiene is a five-semester program that encompasses 83 credits. Entrance requirements include the completion of the healthcare science-dental hygiene track certificate of credit. Applicants are accepted on the first Monday of November through the first Friday of May for a fall semester start. In either program, students will be required to pass a criminal background check and drug screen analysis. Located in Salina, Kansas, Salina Area Technical College offers both a technical certificate in dental assisting, and an A.A.S. in dental assistant technology. The certificate curriculum is two semesters in length and contains both technical and advanced-technical courses. Salina Tech's A.A.S degree program is conducted over four semesters and consists of a 60-credit curriculum containing technical, advanced-technical, and general education courses. In this program, students must maintain a minimum C average in all courses and a 90% attendance rate. Learners must also pass a CPR exam and a tuberculosis skin test prior to all clinicals. Program graduates have gone on to work in oral surgery centers, dental labs, hospitals, and insurance companies. Located in Shoreline, Washington, Shoreline Community College's A.A.S. in dental hygiene degree program is a two-year, seven-quarter, full-time program. The school estimates its total program cost at $25,726, including tuition, lab fees, textbooks, insurance, and exam fees. Applicants must have a 2.5 GPA or higher and are required to have completed a prerequisite series of science classes. Sixty applicants will be selected for interview and 24 will be invited into the program. Upon acceptance, you must complete a series of immunizations, a criminal background check, and possess first aid certification. Located in Charlotte, North Carolina, Central Piedmont Community College offers an A.A.S. indental hygiene. This is a 76-credit degree program conducted over the course of six semesters. Tuition costs total to $5,776 for North Carolina residents and $20,368 for out-of-state residents. Graduates of this program have gone on to work in dental offices, clinics, schools, public health agencies, and professional education. According to Central Piedmont, its program boasts a 90% graduation rate and a 100% pass rate on the Dental Hygiene National Board for the last six years. Missouri Southern State University offers an A.S. in dental hygiene. This is a 90-credit degree program, including prerequisites. All program courses must be completed in a prescribed sequence while maintaining an overall C average or better. Applicants admittance is contingent upon successful completion of a criminal record check, a random drug screening, the completion of physical and dental exams, and the rendering of an acceptable healthy status. In-state tuition fees cost $177 per credit and out-of-state tuition fees are $357 per credit. Located in Eau Claire, Wisconsin, Chippewa Valley Technical College offers a 16-credit dental assistant diploma and a 70-credit A.S. in dental hygiene. The school's dental assistant diploma takes less than one year to complete and must be completed on-campus. The program begins in August or January, and course offerings cover topics such as dental health safety, dental chairside topics, and applied dental radiography. Chippewa Valley Tech's A.S. in dental hygiene is a two-year program that must also be completed on-campus. The program begins every August and subjects covered include dental radiography, dental pharmacology, and periodontology. With tuition, fees, and books taken into consideration, the school estimates the program's as $16,483. According to Chippewa Valley Tech, 100% of graduates secure employment, where they earn an average of $46,143 per year. Located in West Liberty, West Virginia, West Liberty University offers an A.S. degree in dental hygiene, as well as a B.S. in dental hygiene. The school's state-of-the-art clinic features 24 dental operatories equipped with ADEC dental units and a radiography suite consists of nine patient treatment rooms equipped with Gendex X-ray machines for both conventional and digital x-ray imaging. Students are also taught how to operate dental practice management software. Admission requirements for the A.S. degree program include eight prerequisite courses, and a minimum GPA of 3.0. Admission into the B.S. degree program includes the completion of one unit of high school or college chemistry with a lab, the completion of four units of high school math, and one unit of high school or college biology with a lab. All applications must be submitted prior to January 15th of the year you are applying. Located in the suburbs of Atlanta, Georgia State University Perimeter College offers its students an A.S. in dental hygiene. The program starts every fall semester and consists of a total of 77 credits, including general education required courses. In-state tuition costs come to $92 per credit, while out-of-state tuition fees total $350 per credit. Graduates have gone on to fulfil roles in correctional institutions, dental offices, and pharmaceutical sales. Utah Valley University is based the city of Orem where it offers an 83-credit A.A.S. in dental hygiene. This two-year, four-semester program requires students to maintain a GPA of 2.5 or higher throughout the program, and students must also complete a minimum of 20 residency hours. Admission requirements mandate several pre-requisite courses including studies in math, English, public speaking, sociology, psychology, biology, chemistry, and anatomy. Students must pass the Healthy Science Reasoning Test and students are also required to log 20 hours of observation alongside a practicing dental hygienist. UVU's total estimated program cost is $26,573. Located in Ogden, Utah, Weber State University offers an A.S. in dental hygiene. In this two-year program, students are expected to spend 35 to 40 hours on campus each week attending lectures or clinicals. WSU estimates that the program's total cost comes to $20,496, including tuition, fees, instruments, uniforms, association dues, exam fees, and lab fees. Admission requirements include a high school diploma indicating a GPA no lower than 3.0 and certain prerequisite courses must be fulfilled, which total to 34 to 40 credits. CPR certification classes are offered for students. For those interested, WSU also offers a bachelor's degree program in dental hygiene. Dental hygienists benefit from a particularly bright career outlook. In fact, growth in the field is projected at a much higher rate than the national average for nearly all other occupations. Median pay for professionals in the field is a high $72,000 a year, just half of what dental hygienist programs typically cost. Why all this good news? Over the years, the public has come to better understand a link between oral health and health in general. In turn, demand for preventative services continues to increase. More and more patients strive to schedule regular teeth cleanings every six months. As dental hygienists are able to perform routine dental maintenance, dentists are free to see more patients for more complex procedures. With this feather in your cap, you can, of course, go on to work in a dental office. As a professional dental hygienist, you will conduct daily procedures ranging from teeth cleaning to plaque removal to advising patients on gum and tooth health to discussing preventative care, and more. It's also important to emphasize that you're not limited to a single track. Graduates of dental hygienist degree programs also go on to work in pharmaceutical sales, research institutes, insurance agencies, correctional facilities, and more. Being a dental office manager is now completely within your purview, too. If you ever decide to continue your education in a higher degree program, you can also begin to explore teaching opportunities. You can get your feet on the ground and start earning a healthy living with an associate degree. These usually take two years to complete and require a full-time commitment. However, a bachelor's degree opens up the door to an array of other possibilities. According to the American Dental Association, nearly every state requires dental hygienists to graduate from an accredited dental hygiene education program in order to be eligible for state licensure. When you graduate from your degree program, you must go on to take the National Board Dental Hygiene examination -- a comprehensive written exam -- in addition to passing a state-authorized licensure exam. State exams test the clinical skills and dental hygiene knowledge of candidates. Once you receive your license, you can proudly display "R.D.H." after your name, indicating that you are a Registered Dental Hygienist. Several educational and professional dental hygienist associations exist, and it's wise to join them either during your academic career or upon graduation. This will expose you to an array of networking opportunities, national conference dates, published articles, mentorship opportunities, and industry news. The two major associations are the ADHA and the NDHA. You'll want to start with the American Dental Hygienist Association. There, you'll be privy to published articles, professional opportunities, legislative developments, and a calendar of events to share with your colleagues. The ADHA offers varying levels of membership, including a student level and a professional level. Each level requires corresponding fees. For example, professional level membership costs $196. The student level provides very useful tools such as National Board Exam Preparation materials, networking opportunities, and more. Next, take consider National Dental Hygienists' Association membership. Membership benefits include continuing education opportunities, professional development and employment opportunities, an introduction to mentors, and scholarship opportunities. Undergraduate dental hygiene student dues cost $40. After completion of your undergraduate degree, national membership dues cost $155 annually. You'll also want to subscribe to the mailing list for RDH Under One Roof. RDH Under One Roof is a three-day, annual conference where dental hygienists learn from industry leaders. The conference features a huge exhibition where you can view the latest in dental hygiene products and dental equipment. Other benefits include provided lunches, welcome and networking receptions, and plenty of swag. This year's conference will be held in Chicago from August 10 to 12. To determine the best dental hygienist schools, we looked at the most important factors prospective students, mainly common predictors of future success. This boils down to admissions rate, student loan default rate, retention rate, and graduation rate. All data points are taken from information provided by colleges and universities to the National Center for Education Statistics. Each factor is weighted evenly in order to give an objective view and determine the 50 best dental hygienist programs. To calculate our rankings, we looked at a school’s ranking when organized by a single factor, and then averaged each category’s ranking to find an overall score: Admissions Rate (25%) + Default Rate (25%) + Retention Rate (25%) + Graduation Rate (25%) = Final score.